Adding a new area rug to a room can be a daunting task. You’d think it would be easy: just throw down a new rug and you’re done. Then you see all the styles and colors of area rugs out there. And the area rug is such a large, space-defining element in a room, you can’t pick just any rug. 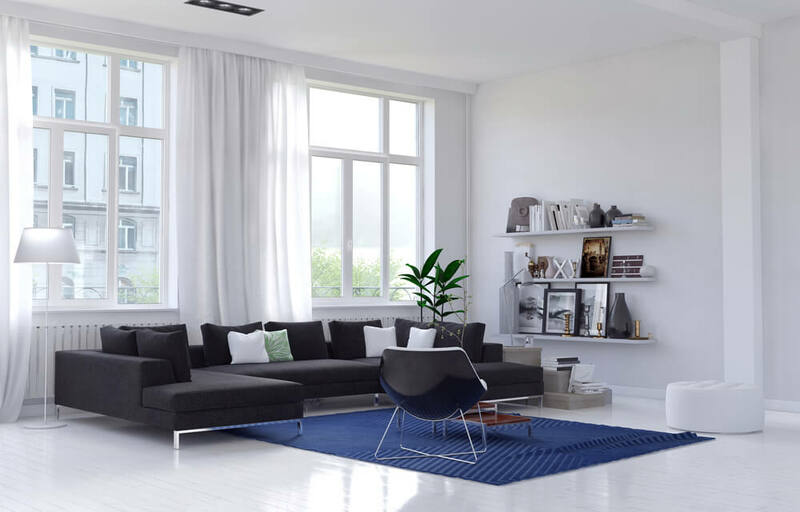 Below are some simple tips that will help you pick out the right rug for your space, no matter which room style you currently have. You may be surprised to find out how easy it is to work with different rug styles. One key way to pick a rug is to match it to the colors you already have in the room. You can see how this idea works in practice in the photo above. The area rug does a good job of incorporating other colors that are in the room. A multicolored rug is good for matching a wide variety of shades that might already be in the space. You can also see how well this idea works for spaces that use a high dose of bright, artsy colors. 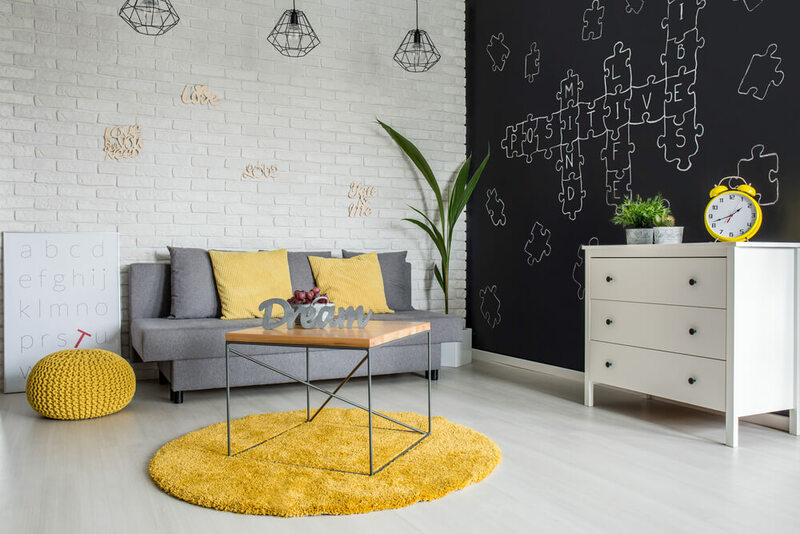 If you have a space with a very specific color dynamic, or that is just colorful in general, you’ll want to focus on the color of the area rugs you find first and foremost. Another idea is to just go bold with area rugs. The photo above shows a very modern space with stark furniture and neutral coloring. Then you have this darker blue, textured rug. Blue tends to fit in anywhere, so it’s not out of place. And it adds some grounded color. You could use this idea for a variety of styles. 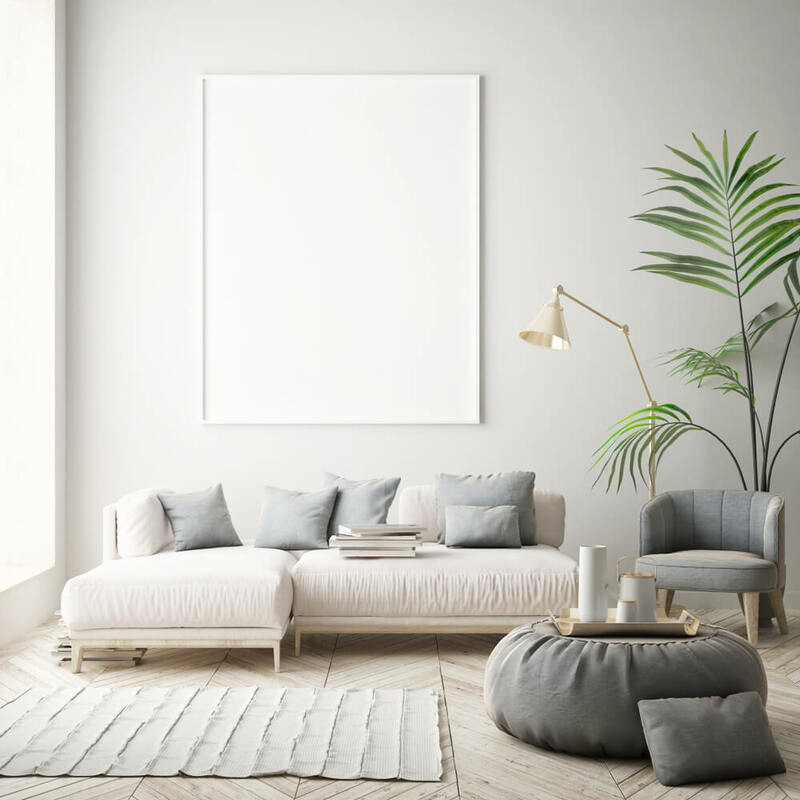 For instance, you might have a regal space dominated by rich wood textures and then put a bright red carpet in the middle of the room for a bold pop of color. This idea allows you to get creative with a space. Accent colors are always fun to incorporate into a space. 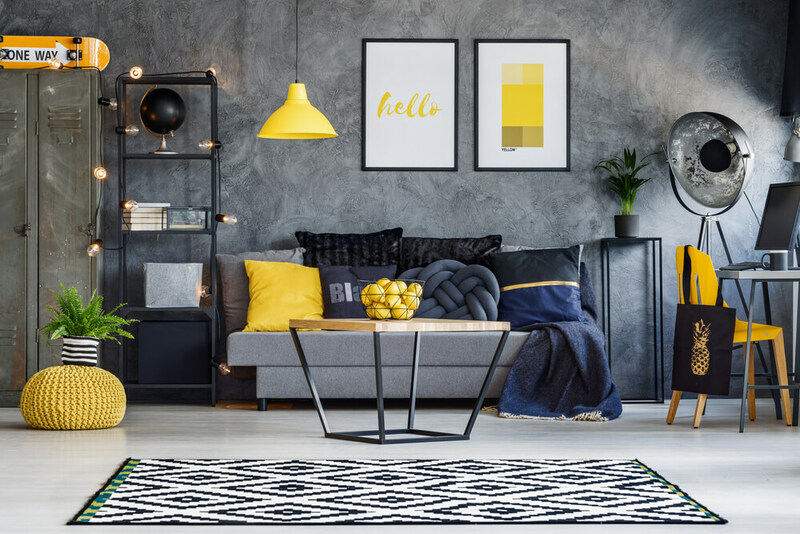 If you see a rug you love and it currently doesn’t fit your room’s color scheme at all, it’s easy to add little elements to make sure it does. For instance, the yellow rug in the photo above matches the yellow throw pillows, pouf and clock. 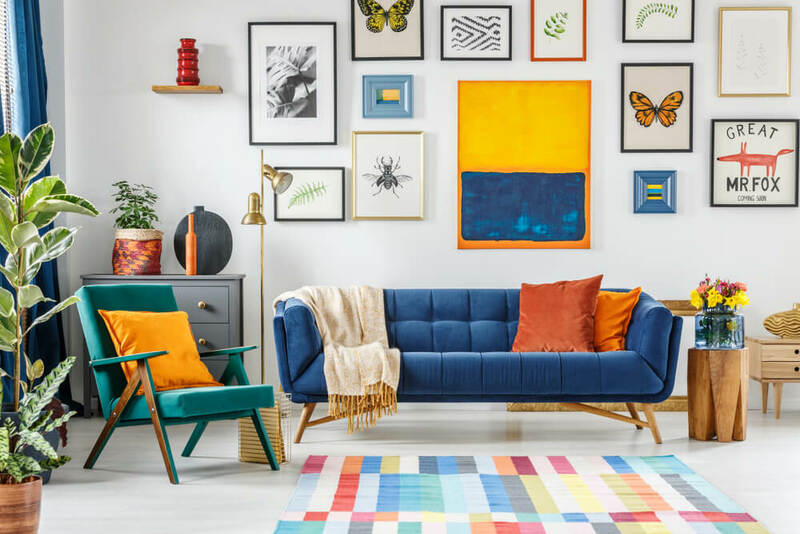 Blankets, pillows and wall art are easy enough to add to a space, too. So you can make virtually any rug fit into your room’s color scheme. This is easiest to do with an already neutral color scheme. However, it is possible to work with multiple accent colors. Another very easy way to put in a new area rug is to go with a very neutral base for the color. For instance, the white rug in the photo above would fit in just about anywhere. However, this one, in particular, goes well with the gray and white color scheme of the space. The photo above shows how you can also use an area rug to work in some geometric detail. The textured lines in the rug do a good job of adding some visual interest to the space. Texture is key to spicing up stark, modern spaces, as you can see in the photo above. Another idea for area rugs is to go for pure geometry. The area rug in the photo above does just that. Any rug that focuses on a geometric pattern will add visual interest to a room. And going for a neutral-colored rug helps it fit in anywhere. You can also see how a rug with a high visual impact like this fits into more modern industrial spaces. These spaces tend to get their style from texture and geometry since they’re usually on the minimalistic side. You can see that principle in the textured concrete wall above. As a result, a textured or patterned rug fits perfectly into more modern industrial styles as an accent piece. The post How to Make Area Rugs Fit In With Your Room’s Style appeared first on Freshome.com.